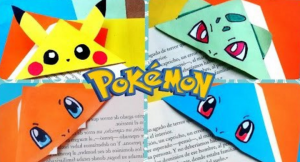 I found these video tutorials awhile back and made up some of these bookmarks. I had a great time because they’re easy!!! And addicting! You can’t make just one!!! There’s something kids can do . 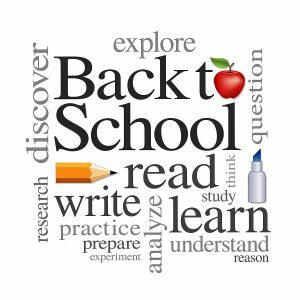 . . and with Back-to-School pushing into the forefront of our priorities, I wanted to give you something to do and for your children to do that would be useful. I remember how popular those bracelets were and maybe still are that kids were making for their friends and family. Well, these may be the next thing . . . maybe not, but I know of several kids that have made money from their bracelets . . . so why not these bookmarks. I’m all for encouraging the young . . . we’ve come a long way from the lemonade stand of my day. Paper crafts are my thing . . . so I’m enthusiastic about these bookmarks. I hope you will be, too. 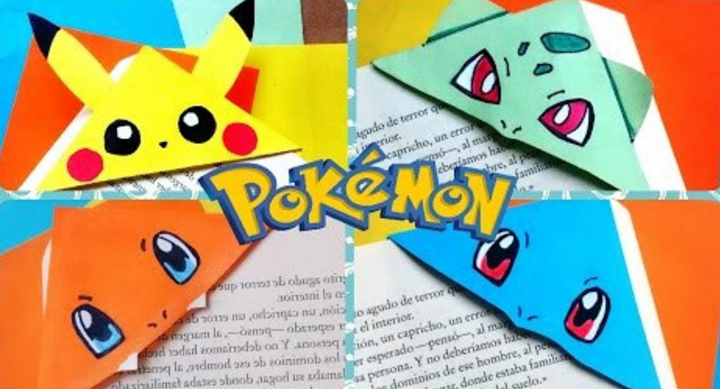 This video tutorial will give you the basics and a great Pikachu bookmark. And, here’s the Pokeball bookmark. I could go on and on about these bookmarks, but you may prefer to go through Red Ted Art’s playlist and find the right ones you want to make. There are plenty of them . . . Angry Birds, Minions, even Sponge Bob and Finding Dory . . . Nemo, too. There are Emojis and all sorts of characters you may find appropriate for your particular style and interest. Just as a thumbnail. I think she began with a 6 inch by 6 inch piece of paper, but she encourages you to experiment with different sizes and to use the scraps you have around. She sometimes uses origami paper, but colored printer paper works well, too. You may want to use a thicker paper for your embellishments such as beaks and ears so they don’t get smooshed and torn with continuous use. Once you learn the basics, you can create to your hearts content. They’re great as Back-to-School gifts your kids can give their friends, but think about all the great Halloween characters you could make . . . those will really be fun! And you can skip ahead to Christmas . . . and even think about Valentine’s Day . . . But before we get too carried away, it’s important to make up a few of them. There’s no better way of learning than by doing. And teaching someone else . . . like your kids . . . I think they’ll be a natural at it! As you can see, these are easy to make and great fun to do! July, 2016 has been memorable. Being an election year for those of us in the United States of America, both parties selected their candidate for President along with their Vice President. The campaigns may be heating up for the final outcome in November. But before then . 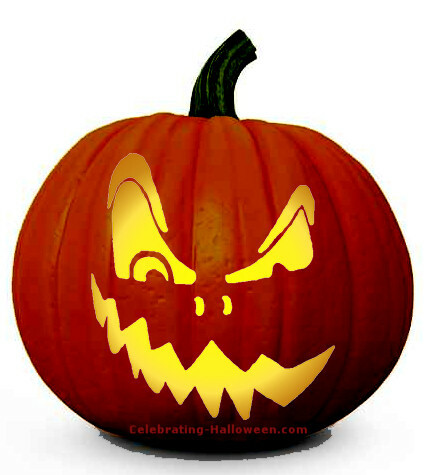 . . we’ll be getting the kids off for another school year and Halloween!!! There are still some days of summer to enjoy, though. Maybe a last trip someplace. Getting more swimming in and enjoying the warm temperature. I don’t know if that dreaded essay of “What I Did Over Summer Vacation” is still asked. If so, now is an excellent time to get thinking about that. Helping the kids by hitting the highlights of those who had a very active summer . . . and for those who didn’t . . . thinking of ways of making at least one thing you did with your family sound interesting. When I think back on summer vacations, I think of all the time in the car. Yes, we saw lots of things and had fun at a cabin on the lake or going to National Parks . 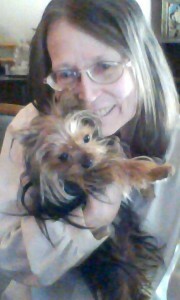 . . and even visiting relatives . . . The task of sitting down to write about it took all the fun out of what fun we did have. And, the absolute worst part was reading them aloud . . . Yes, that was torture listening to what others did . . . some were as lame as my summer vacation. I’m way past that . 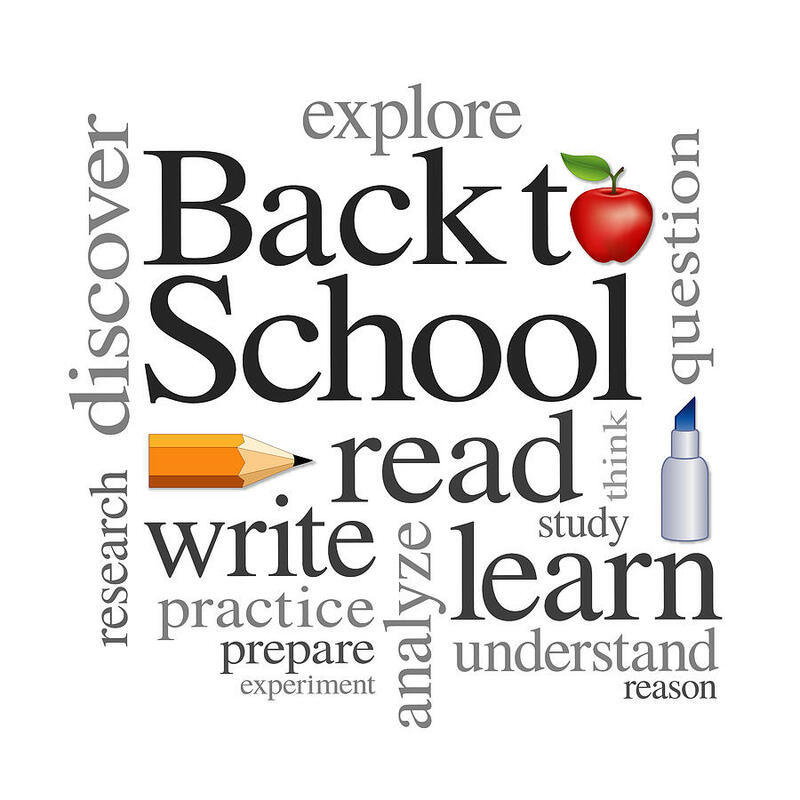 . . but I do get a cold shiver down my spine when school opens each year . . . even though I’m definitely not involved. Maybe I’m having empathy for all those students . . . Times have definitely changed . . . but those “first day butterflies” may still remain. I’m never disappointed! There is always something available to help me out. Honestly, I was thinking of doing a kick-start into Halloween. . . I know it’s still too early . . . so I went with the back-to-school theme. But don’t be surprised as you’re shopping in preparation for a new school year, you don’t see Halloween stuff . . . The stores always seem to start early . . . and by the time I may be ready to think of buying stuff . . . those shelves may be getting a bit bare . . . Strange isn’t it? We’re always being pushed to the next season and the next holiday. Enjoy your remaining days of summer! I love paper crafts . . . especially boxes I can fill with interesting things. This closure box seems suitable for many different occasions and different age groups. You can decorate them however you like . . . using the designer paper of your choice . . . and, of course, filling them with whatever seems appropriate. 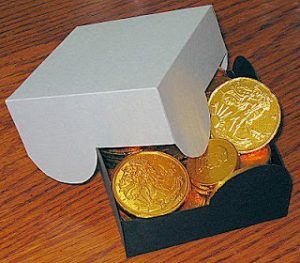 These coins remind me of Pirate Treasure . . . This box can be used for anything . . . even a gift card . . . or an invitation to a family movie night . . . or a family board and card game night . . . or . . . making s’mores over a backyard fire pit and tell ghost stories . . . These summer nights are always good to spend with family . . . You can also do some star gazing. Click the picture on the right and you’ll be taken to a PDF template that you can download and then print out. This is one of those boxes you can decorate for different holidays and special events throughout the year. They are easy to assemble. Trash is on my mind because I’ve been wrestling with the barrels. In front of every house on the street is a house waste barrel, a yard waste barrel and perhaps the recycling barrel. This signifies the bulk of your eating and cleaning up your yard for the week. I don’t go into the barrels on the street. Once in a while you do see one that has been dumped . . . do you look or glance away? Of course you look! You see the egg shells, a bacon container wrapper . . . a frozen dinner or two carton . . . a frozen pie container . . . cereal boxes . . . You may learn they use soy milk . . . or other interesting things. Have you noticed that when two barrels have been dumped side-by-side, one is yours and the other a neighbor that you can distinguish your trash from that of your neighbor . . . egg shells pretty much look alike . . . but you know . . . you just know! It’s all those subtle things . . . pancakes . . . what do they put on them? Do they make them from a mix or buy them frozen? Are they a nut-free household? These aren’t things you discuss with your neighbors . . . but their trash is a fountain of information. The soda they drink . . . regular or diet . . . which cola? Maybe not cola, but root beer or Orange Crush . . .
Maybe beer and wine . . . or hard liquor . . . Those bottles get recycled regularly. You can even find out their brand of pickles . . . and condiment . . . the very basic stuff of their life . . . 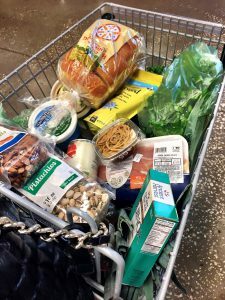 I don’t pay attention to what others buy at the grocery store, but I’ve noticed some interest to what is in my shopping cart. Sometimes . . . when I’m buying frozen stuff and junk food . . . not when I’m buying fruits and vegetables and healthy stuff . . . I do like a blueberry muffin and buying them from the bakery section is so much easier than making them from a mix. And that goes for cookies, too. We find what is good and easy and what our family likes . . . There’s no mystery to that. I have a grocery shopping day coming up . . . so that’s why this is on my mind. I have to decide what I’m going to put on my list and not go crazy once I get to the store. I try to eat healthy, but I also like to have something to snack on from time to time . . . and a bit of variety is always welcome. I’m sure none of us have a shopping cart full of healthy stuff we’d we proud to display on a website. Maybe . . . depending upon the topic of the article . . . In reality we have a mix of healthy and fun food . . . and easy food to make . . .
We may not be winning any awards for our shopping and the meals we make, but we’re healthy and happy with healthy and happy families. We’re real . . . some people go to fast food places to fill in the gaps of their grocery shopping . . . I can honestly say I can’t remember the last time I bought fast food . . . it’s not that it’s bad, it’s just not on my regular route. Well, all I can truly say that trash day and shopping day are highlights . . . at least I highlighted them here. I’m sure you have an opinion about this . . . please leave me a comment. This does seem quite refreshing . . . after last week . . . Yes, for one . . . my air conditioner decided to go on the fritz. It was repairable . . . it was repaired . . . and much more comfortable with the three digit temperatures . . . which are to get a bit cooler this week . . . hopefully. Oh, my thoughts are turning to the wonderful blissful fall . . . but, alas, it is much too soon to be yearning for fall . . . but I can pretend and get into the fall crafts . . . which goes into the Halloween thing. Yes, it may be too soon . . . but better early than too late. Halloween party preparations should be planned carefully and not rushed. The same goes for the party favors. 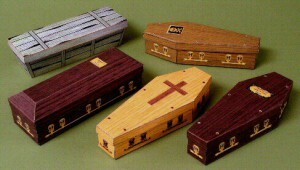 I have all these great coffins to make. Have you tried them? They do come together rather quickly, but they do need something more . . . and here I have a stack of these that need to be embellished and stand out . . . And to do that takes time. I’ve been thinking of cobwebs and maybe pumpkins . . . perhaps a vampire, witch, ghost . . . a haunted house . . . or school . . . Something that would be more exciting than the candy inside the coffin . . .
I’ve always thought these would be good to hold a mini-album . . . or an original story . . . something creepy and spooky . . . but then, again, guests are into the candy . . . just like when we were children . . . There are just some things we don’t outgrow . . . no matter how old we get. But, decorating has to do with getting into the moment . . . the essence of Halloween . . . which is basically imagination . . . drawing others into our imagination . . . and sharing it . . .
Could be a bit lame . . . but worth a try. These could go with the theme of your party . . . pirates, perhaps . . . witches . 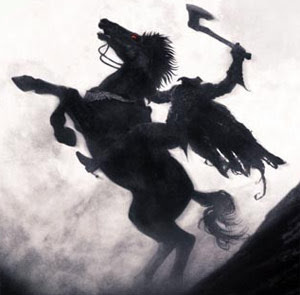 . . or the Legend of Sleepy Hollow . . . Whatever happened to Ichabod Crane? That might be a lovely way to spend All Hollow’s Eve . . . figuring out what happened that fateful night returning home from the Van Tassel’s Harvest Feast . . . after Ichabod left crushed by Katrina’s refusal of his marriage proposal . . . So caught up in his own imagination and the story told of the famed Headless Horseman . . . Yes, the ghost of the decapitated Hessian soldier in hot pursuit on his tail . . . Ichabod crosses the bridge near the Dutch burial ground — supposedly the ghost was incapable of crossing that bridge . . . The next morning, Ichabod’s hat is found abandoned near the church bell bridge . . . and not far behind, a shattered pumpkin. And . . . what are we to make of this? Many do believe that young Ichabod Crane left Sleepy Hollow . . . and sought comfort in another village . . . with another farmer’s daughter . . .
Or was it more sinister? Did Ichabod get spirited away by the Hessian soldier . . . was he, Ichabod, now destined to ride through the night, reliving over and over again that fateful night? Or was there an encounter with the town rowdy, Abraham “Bron Bones” Van Brunt? Many do believe he dressed up like the Headless Horseman to run his rival for the fair Katrina affections out of town . . . Did he succeed? And did they work together to carry out this charade? With a little imagination . . . you and your guests can come up with dozens of possibilities. And the gift you make for each of your guests will be a paper craft coffin with an Ichabod Crane hat and a shattered pumpkin on top . . . maybe that bridge would be a good touch or the graveyard . . .
And, of course, there will be a lovely assortment of sweet Halloween candy inside.